LinuxCloudVPS.com Review 2019: Is LinuxCloudVPS.com a Good Hosting? LinuxCloudVPS.com is a long-standing U.S. host with its own data center. Its plans come with a solid uptime SLA, excellent customer service, and SSD storage. The only downsides are a short money-back guarantee period and a few unnecessary add-ons. LinuxCloudVPS.com is a subsidiary of Rose Web Services LLC, which has been in business in St. Louis, Missouri, since 2001. This vendor’s modern website is available in English. This vendor owns and operates its own data center located in Missouri, U.S.A. With a fully redundant infrastructure, no single point of failure, and SAN cluster systems for extra data protection, your data will be 100% isolated. Although the product pages imply a 100% uptime guarantee (which is uncommon in the industry), digging deeper reveals that this is actually a lower 99.9% uptime guarantee, albeit backed by a solid SLA. 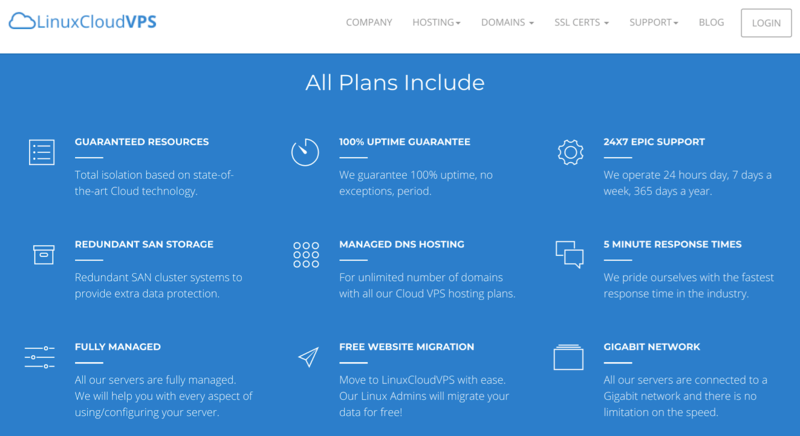 All of the plans are fully managed, which means LinuxCloudVPS.com will help you with every aspect of maintaining and configuring your server, cloud security, DNS, and data backup. In fact, the support team confirmed to me that they will install and configure any software you need, at any time, and no additional cost. One downside is that unlike many hosts that offer daily backups, this vendor only does weekly backups. The plans come with everything you’d expect in terms of advanced level features, including PHP support, phpMyAdmin tool, MySQL databases, remote MySQL connections, as well as SSH access and Cron jobs. This provider’s plans are good value for money, especially when you consider that it owns its own data center and the plans are fully managed with 24/7 support. Unlike a lot of VPS companies, LinuxCloudVPS.com will set up your hosting within ten minutes of taking your payment. You can only pay for plans monthly, so there are no discounts for longer commitments, and there is a minuscule 7-day money-back guarantee that doesn’t give you much time to decide if you did the right thing. One of my gripes is that at the checkout you are invited to purchase the cPanel or DirectAdmin control panels at extra cost, whereas I would personally prefer these to be included in the package price. Maybe it’s because this company supplies managed services, so it doesn’t expect you to control your own hosting. 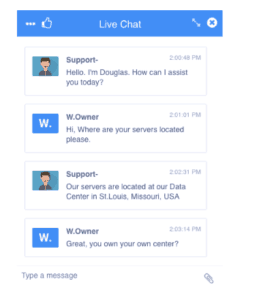 LinuxCloudVPS.com provides 24/7/365 customer service by live chat, email, phone, and a client support area that can be accessed by logging in. The commitment to a five minute response time is way above average for the industry, which is fortunate because the limited knowledge base won’t get you very far in terms of self-support. I contacted the team via live chat on a weekday morning. As you can see from the timestamps on the messages, the operator picked up straight away and answered all of my questions warmly and efficiently. LinuxCloudVPS.com has been providing U.S.-based hosting services since 2001, and its plans come with a good uptime guarantee plus excellent customer service. It’s hard to find fault with this company, which could only be improved with a longer money-back guarantee and by including the costs of control panels in the plan prices. Wondering how LinuxCloudVPS.com stacks up against other Web Hosting companies? Enter any other Web Hosting company and we will give you a side-by-side comparison.